RV Lottery spaces on E. Polo Field Way are not available for move-in until Tuesday, 10/30 at noon due to concerns for safety and liability as show set-up will still be in progress. If you need to arrive prior to 10/30, arrangements can be made for a parking space with WestWorld in one of their RV lots as space is available – 480.312.6802, select Option 1. You can then move into your space at noon on Tuesday, 10/30. Rental RVs may not be dropped at the site until Tuesday, 10/30 at noon. Please make specific arrangements with your rental company to schedule delivery of your RV no earlier than Tuesday, 10/30. We also ask anyone staying in one of the WestWorld RV lots to stay off of the field during show preparations as heavy equipment will be moving through the grounds. Everyone’s cooperation is appreciated for a safe and fun event. Thank you! A final list with assigned spots will be available shortly, along with maps and instructions for RVs in these reserved areas. 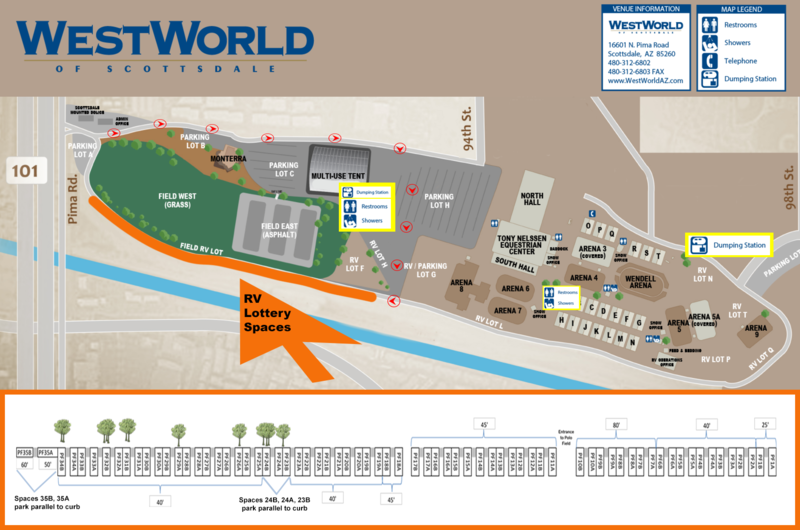 UPDATE 9/27/2018 The names have been drawn for the available premium spaces on E. Polo Field Way at WestWorld. We are in the process of sending emails to each winner to confirm that they want the space or wish to pass. Please check your email if you have submitted a lottery application for a premium space, as responses are due back to the office by end of day 9/28. Following the premium draw, a drawing will be repeated with the remaining spaces and those winners will be notified to confirm. Actual parking spaces will not be assigned until we have confirmation from each person. A final list of spaces will be available after the lottery is complete. A post will be made on this page when it is available. WestWorld is taking RV reservations for lots F & G, which are located at the East end of the polo fields – all include water and electric. There is a dump facility located on the WestWorld grounds. Call WestWorld at 480.312.6802 and press Option 1 for fees and amenities. If there is no answer, please leave a message and someone will call you back to make your reservation.